Puppies will act like puppies. You can count on it. Like little kids, they pretty much want to be wherever you are, doing whatever you are doing. They will readily refuse to participate if the activity is not fun (visualize your last vet visit for proof). And if there is trouble to get into, your puppy will be the first to find it and jump in. All of these and more are excellent reasons to invest in a puppy playpen. 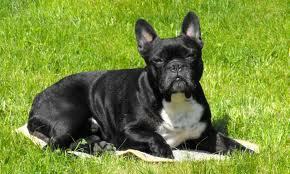 Your puppy can romp and play, and you can enjoy the kind of peace of mind you likely won’t find anywhere else. 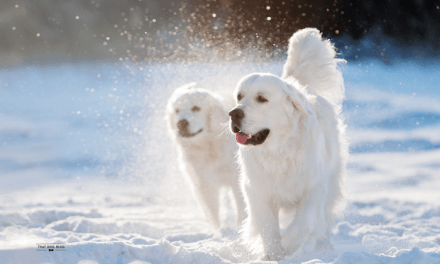 Read on to learn about how to choose a puppy playpen and some awesome puppy playpen options we love. Apuppy playpen, like potty training, mastery of basic commands and the right food and exercise, is an invaluable tool during a puppy’s growing up period. The playpen will slowly acclimate your puppy to spending some time engaged in independent play (i.e. without you in attendance). In time, your puppy will begin to see his wire pen as a friendly, safe space where he can romp, rest and relax. 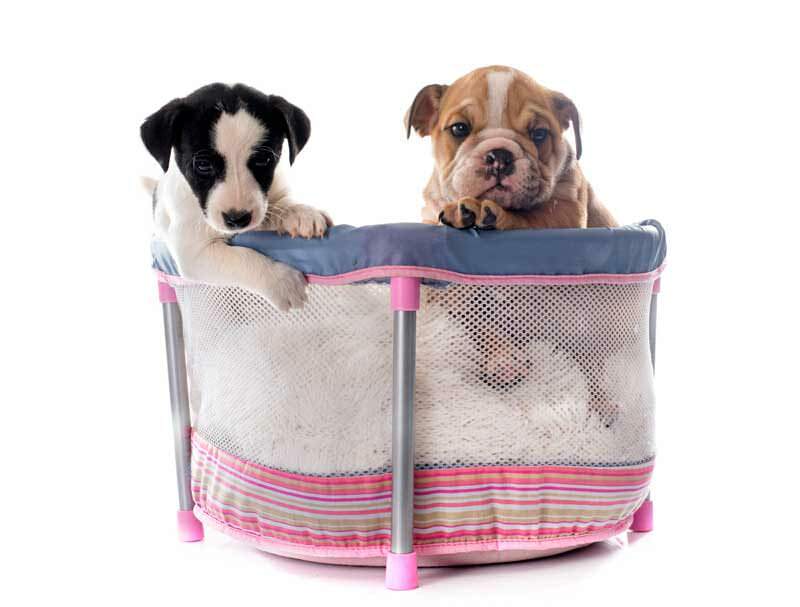 Most importantly, a playpen can keep your puppy safe in non-puppy-proof areas of the home and yard when you aren’t available to supervise him personally. of frustration… and your pillows. Selecting a puppy playpen is not rocket science, but it can take some time and research to figure out what sets some playpens apart from the (um) pack. 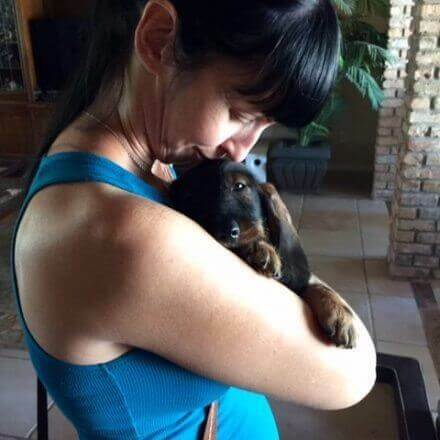 Like most dog owners, you work hard and know a puppy is a financial commitment. Our goal is to help you find the right pen for your puppy at the right value. 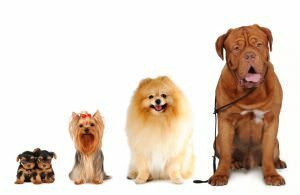 In general, you want to look for these key features in any puppy playpen you may consider purchasing. Since the playpen will be a place where your puppy can play and nap, you want to be sure it is roomy enough to last for at least the next several months as your puppy continues to grow. 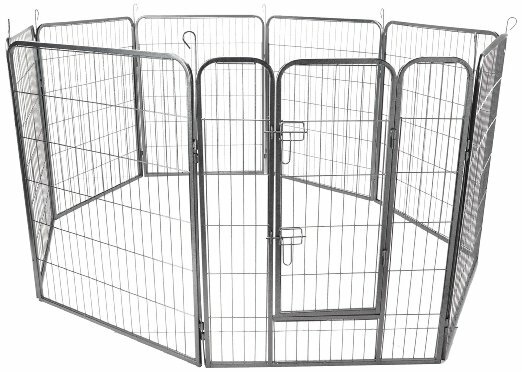 Many puppy playpens can be expanded with the addition of extra divider walls, so if your puppy is going to grow a lot over the next few months, be sure to look for this option. exercise pens is that they can be used both inside and outdoors. The BestPet Heavy Duty Pet Playpen is great for outdoor play (it is best used outdoors since the material is heavy enough to cause some abrasion on floors and carpeting indoors). It has 8 nice, high 40-inch panel walls and a single double-latching door. The metal sides stakes can be driven into the ground for extra stability. Best of all, the playpen is foldable for travel (although a bit heavy to lift) and yet durable enough to make it safe for use during camping with your dog and other overnight outdoor adventures. movable can be really convenient. The Regalo 192-inch Super Wide Gate and Play Yard hits high marks for its 19 sq. ft. of interior play space. There are a total of 8 panels that can be removed as needed. This pen also doubles as a gate and a play area for indoor/outdoor use. If you like, you can connect more than one Play Yard together for even more play space. It is easy to set up and break down and can fold for travel. Additionally, the steel material makes it durable and weather proof. this gate can get to when open. That’s why we like Regalo. While with most dog products, we often go choose companies that manufacture goods targeted to dogs, Regalo makes home goods. They understand that your new puppy gate is not just a way to contain your puppy, but also becomes a piece of furniture in your home. We like the quality of their products. There are a lot of products by Regalo that are super useful for dog owners. It won’t take your puppy long to figure out that those puppy playpen walls are made for climbing…or jumping over. 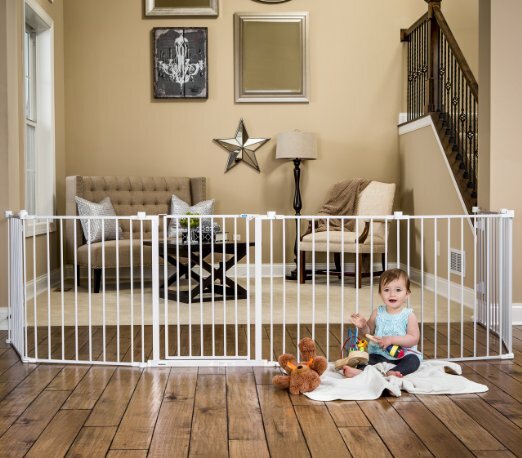 To deter future high-jumpers from practicing their skills on the playpen walls, go ahead and opt for higher walls to start with. The Richell Convertible High Pet Playpen is one puppy playpen even the most determined climbers won’t be able to outsmart. Made for very smart smaller dogs, this weatherproof playpen comes with a wealth of features designed to outwit your puppy’s wiliest schemes. The locking caps keep your puppy from trying to dismantle the pen. The vertical bars put climbers in their place promptly. There is even an escape-proof safety lock. It can also be used as a dog gate. we’d tell you we wanted to see pics! this is a good option for you. The SmithBuilt Animal Dog Playpen Folding Exercise Yard with Door and Carry Bag is a slam-dunk choice for tall, strong puppies who might readily escape from shorter or flimsier playpens. The playpen comes in 4 sizes – the tallest is a whopping 48 inches (4 feet). With 12 feet of panels, you can add or remove space as needed or use some panels as inserts for multiple pets. The material is epoxy-coated steel weatherproof wire and setup/tear-down is a breeze. Larger playpens have double-latch doors. you will want to be sure the playpen you select can fit into your vehicle once folded. The Precision Soft Side Playpen is a clear front-runner in our book for so many reasons. For starters, it folds up readily and is highly portable. It features a removable top and bottom panel for safety and shade. This is especially important if you think you are going to want to take your puppy for a picnic in the park. You want to make sure they don’t get overheated and have the ability to seek shade! The side panels offer varying levels of ventilation and visibility. It is made of soft yet durable and weatherproof material. It also comes with stakes to make for a more secure outdoor pen when you’re using it outside. If you’ve ever had a small puppy crunch down on a wiggling finger or toe with those shark-like sharp baby teeth, you already know exactly how much damage puppy teeth can do (not to mention puppy claws). So you want to select a puppy playpen with a stable, sturdy, durable frame that can withstand chewing, scratching and clawing, head-butting, wall-scaling and other favorite puppy maneuvers. 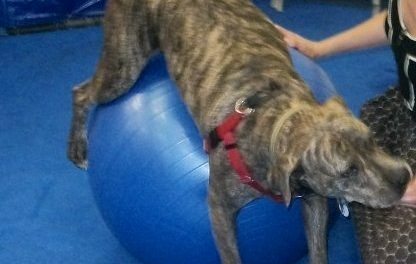 The MidWest Pet Exercise Pen has so much to recommend it. 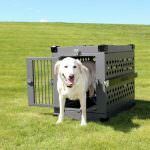 If you’ve read other posts we have, like our dog crates guide, you know that we are big fans of Midwest Pet products. This playpen is very stable and durable, with corner stabilizers, ground anchors and sturdy metal panels. It comes in 5 heights to keep even the most determined jumpers and climbers safely inside. You can choose from a door-less or door model (door models feature a double latching safety lock). With 8 panels, your puppy gets 16 sq. ft. of play space – enough for a bed, a potty area and plenty of room in between. It is simple to assemble and coated for weatherproofing. Part of the charm of a puppy playpen is a guarantee of safety when you can’t watch your puppy every second. But if the puppy playpen begins to rust, corrode, swell, mold, crumble or crack, your puppy can then begin to encounter dangers from within the playpen itself. Obviously this will be far less of an issue for an indoor playpen versus an outdoor playpen. But it is something worth considering both for the sake of your puppy’s safety and the sake of your wallet. 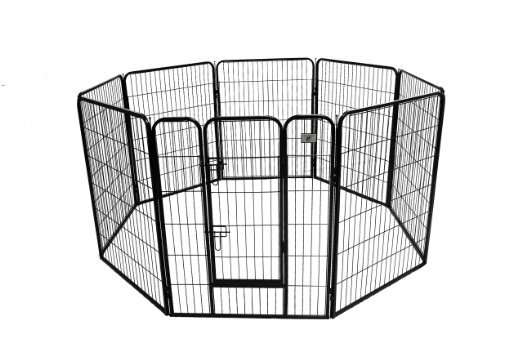 The IRIS Indoor/Outdoor Plastic Pet Pen is another one of our favorites. For starters, it is made of durable, weather-proof reinforced plastic that can be used indoors or outdoors without rusting or corroding. It comes in a 4-panel or 8-panel packet for easy expansion as needed. The walls are just under 3 feet high, making it great for small puppies that will become small or mid-sized dogs. Always an added bonus: it comes in so many cool colors! A good latch is key if you want to be sure the puppy playpen offers some refuge from potential predators. It goes without saying that if your puppy is quite little and you have aerial predators such as owls or hawks in your area, you should never leave your puppy in the playpen unattended. It is also unwise to leave your puppy in an outdoor playpen after dark, when other dangerous nocturnal predators such as coyotes or foxes may attempt access. 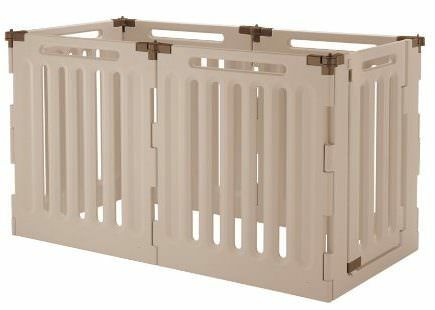 If you live in an area with lots of snakes or pesky rodents, you might want to consider a puppy playpen that includes a secure floor that seamlessly attaches to the walls. This also prevents your puppy from eating any of the various types of mushrooms that are dangerous for dogs. If you put your dog out in early spring while the ground is still thawing, you may not notice mushrooms that it begun to grow. 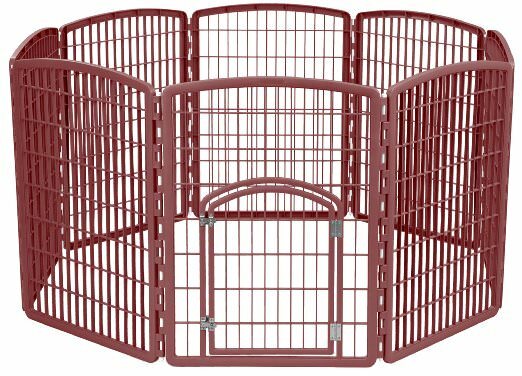 The Oxgord E-Coated Playpen comes in three different sizes to accommodate puppies of all sizes and capabilities. Setup is a breeze – you don’t even need tools. This is one of the features we like the most. If you have a new puppy, there is nothing worse than trying to keep track of screws, build a puppy playpen and keep an eye on your new puppy. The finish prevents corrosion from rust. This is part of why we include this in our list of the best puppy playpens, indoor/outdoor functionality is something we always like. Each panel comes with ground anchors for extra stability and security. The door is built into one of the panels in models that have doors. The playpen itself easily folds up for travel. This one is a win all around. A few tips on getting your puppy acclimated to your new puppy playpen. After you have spent so much time (and likely more than a few dollars) selecting a playpen you think will be just perfect for your pup, you definitely want to be sure the meet-and-greet phase goes well! Enter the playpen with your puppy. One of the hands-down best ways to get your puppy to trust the new playpen is to go inside together. By walking in and out, in and out, in and out several times, your puppy can begin to see the playpen is a safe and even fun place to spend time in. Start with short supervised play periods. Once your puppy is used to going in and out of the new playpen, you can facilitate a short play period with your puppy inside the pen. Then you can progress to simply watching your puppy as he plays inside the new puppy playpen. In this way, your puppy never gets the mistaken notion that the playpen is a prison or punishment. Use the playpen when you are home as well as when you are gone. 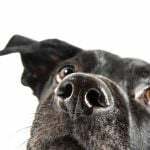 This is especially important with indoor playpens, since your puppy will be able to hear and smell your presence even if you are not in the same room. 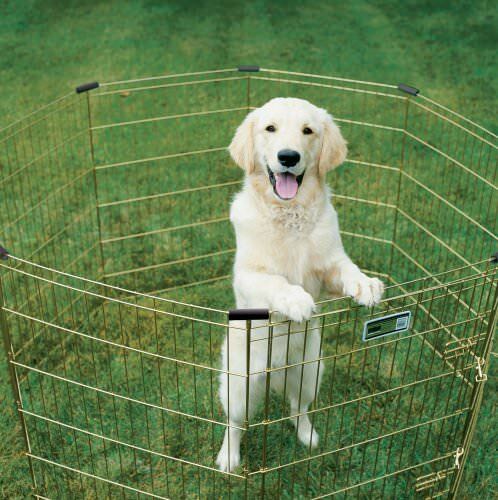 To be sure your puppy understands that the playpen is a pleasure and not a punishment, be sure to put your puppy inside both when you are home and when you are not home. Put favorite items in the playpen. In general, puppies love anything that smells like you. An old shirt, a blanket, some odor-rich socks – anything that has your scent will convey safety to your puppy. Also, don’t hesitate to “bait” the new playpen with a favorite toy or even a tasty (but healthy!) treat. Give your puppy time to adjust. 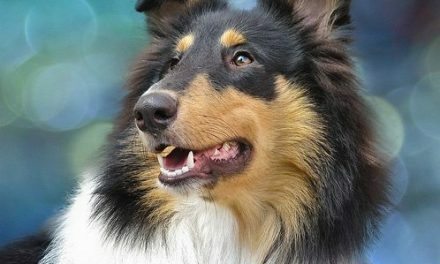 If your puppy has become used to “training” you by whining, crying, barking, whimpering or scratching, you may have a few nail-biting days to wait out these behaviors before your puppy realizes they won’t work this time. By waiting out these manipulative behaviors and leaving your puppy in the playpen, you will both win – your puppy will get a safe, comfy play space and you will get some much-needed peace and quiet! 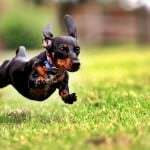 Finding the best puppy playpen for your pup can take some time and research, but it will pay off in many ways as your puppy learns to enjoy his independence in his own dedicated playpen. 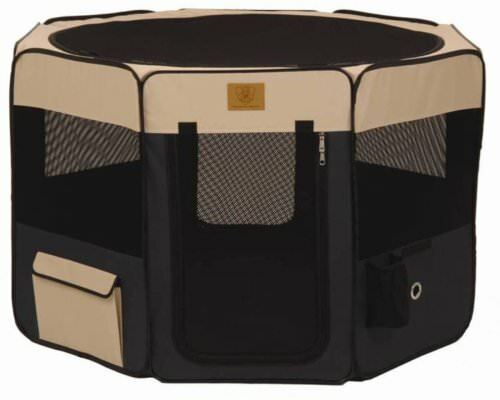 When you travel, the playpen will help your puppy feel more comfortable and confident in strange surroundings. At home, you can feel at ease knowing your puppy is safe and secure inside the playpen while you work, run errands or tend to other family members. 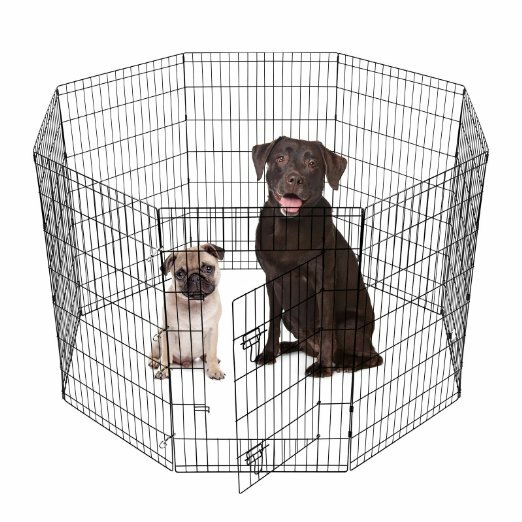 Best of all, the puppy playpen can be a valuable training aid for housebreaking/potty training, obedience training, self-soothing behaviors, cessation of manipulative whining and barking and other goals you may set. 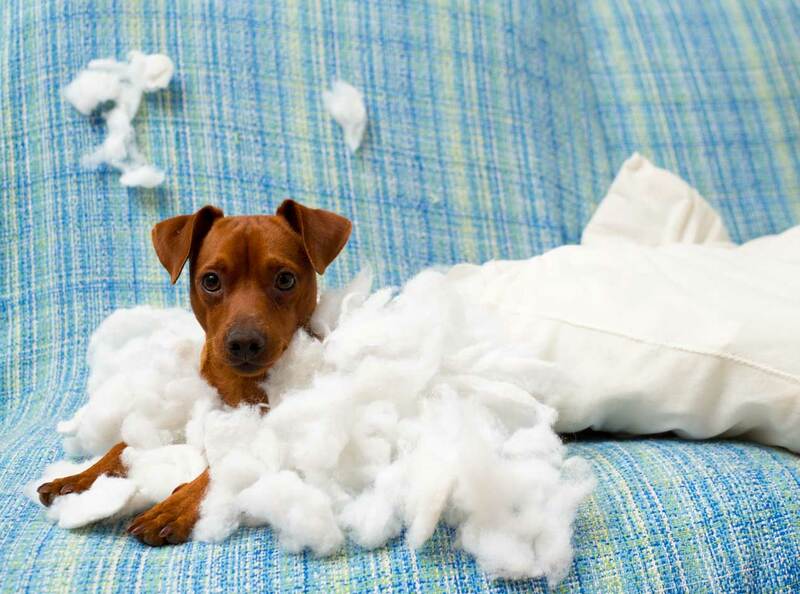 PreviousChoosing Dog Toys: Ever Thought About Making Your Own?